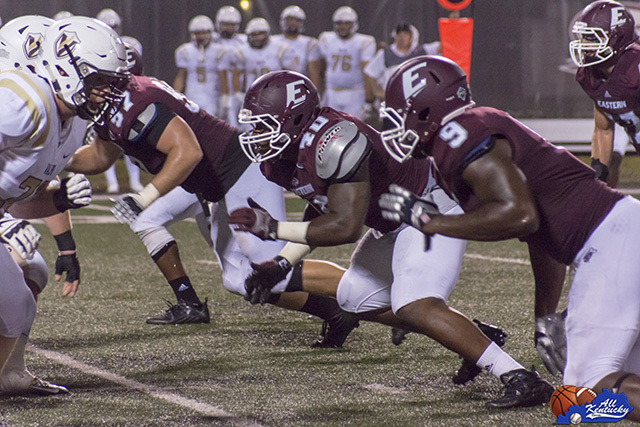 RICHMOND, Ky. – Eastern Kentucky University’s football team will play its first home game of the season Thursday night against the University of Pikeville. The Colonels have won seven straight home-openers. The game, presented by Pepsi, will begin at 7 p.m. at Roy Kidd Stadium. The live radio broadcast is available in the Richmond area on WCYO 100.7 FM, and can be heard worldwide on EKUSports.com. A live free video broadcast is available on OVCDigitalNetwork.com. Pikeville is coached by former Colonel quarterback Allan Holland Jr. He led Eastern to back-to-back OVC titles in 2007 and 2008. He was chosen as the Ohio Valley Conference Offensive Player of the Year in 2007. In three seasons as a Colonel (2006-08), Holland threw for 4,695 yards, fourth most in program history. The Hazard, Kentucky native tossed 26 touchdowns passes while completing 60 percent of his passes. He also ran for nine touchdowns. Two of Holland’s assistants – offensive line coach Will Heineman (2002-05) and defensive line coach Andrew Soucy (2007-10) – both played at EKU. The Colonels are coming off a gritty performance at Big Ten opponent Purdue in their season-opener on Saturday. Despite falling behind 21-0 early, EKU battled back and went into the fourth quarter down only 10 points. Eastern had 284 yards of total offense in the first half. The Colonels out-gained the Boilermakers 123 to 85 on the ground in the first half, had five more first downs and converted six more third downs. The EKU defense held Purdue scoreless in the third quarter. The Eastern Kentucky offense was stopped for a loss of yards just one time against Purdue and the offensive line did not allow a sack. Only four FCS teams in the nation began the season with just one negative play. Redshirt senior Kiante Northington had a game-high 11 tackles against the Boilermakers. Devin Borders enters Thursday’s game with 1,495 career receiving yards. He is 71 yards away from cracking Eastern’s top-10. The redshirt senior had seven catches for 77 yards at Purdue. The Colonels are ranked 24th in the nation by College Sports Madness and continue to receive votes in the FCS Coaches Poll and the STATS Poll. Pikeville enters Thursday’s game with a 2-0 record and a 1-0 mark in the Mid-South Conference. The Bears opened the season with a goal-line-stand at the end of the game to preserve a 24-20 victory at Bluefield. UPike then knocked off No. 17 Campbellsville at home by a score of 41-34. The Pikeville offense is averaging 454 yards per game, including 331.5 through the air. Sani Warren, a 6-foot-1 junior quarterback from Belfry, leads the UPike offense. He has completed 69 percent of his passes for 652 yards. Warren has tossed four touchdown passes and no interceptions. He has accomplished this behind an offensive line that starts three true freshmen, a redshirt sophomore and a junior. • Parking in the Alumni Coliseum (AC) lot WILL NOT be closed to commuters during the day on Thursday, Sept. 8 at any time; this includes the upper east lot and the lower east portion previously reserved exclusively for Colonel Club members. • In our best effort to serve our loyal and dedicated Colonel Club members who so generously support our student-athletes and programs, a section of the lower east AC lot will be reserved for tailgating on a first-come, first-served basis. Also, beginning at 4 p.m. and as spaces open up in the AC lot, our Colonel Club members and fans are encouraged to tailgate and experience a Colonel game day. • A reminder to Colonel Club members: an alternate route to the Colonel Club parking area is available by entering near Model School. • Alternate parking areas include: Greg Adams Tennis Complex Lot, Ashland Lot and Perkins Lot, all located across the Bypass from Roy Kidd Stadium. • Please use one parking space per car or truck. • From one hour before the start of and 30 minutes after the conclusion of home football games, Roy and Sue Kidd Way will be closed to vehicle traffic from Van Hoose Drive to the Eastern Bypass. • After each game, Kit Carson Drive will be closed to southbound traffic from the Park Drive intersection to the Van Hoose intersection. This closing will occur at the end of each game and will last normally for a period of thirty (30) to forty-five (45) minutes. However, the closing may occur earlier and last longer than anticipated depending on traffic conditions and the size of the crowd. • All state and local laws must be observed. • Responsible alcohol consumption will be allowed in designated locations in the Colonel Club and Alumni Parking lots for attendees age 21 or older only. • For safety reasons, all beverages shall be consumed from plastic or paper cups and not in cans or bottles. • Kegs are not permitted. • Please clean up your tailgating area before going to the game or leaving the parking area. • Please behave in an appropriate and responsible manner. Throwing objects or climbing on vehicles is not permitted. • The handicapped seating area at Roy Kidd Stadium is located on top of the hill in the end zone opposite the scoreboard. • Patrons must purchase a General Admission ticket to watch the game from this area. • Patrons are welcome to have a companion sit with them in the area. Folding chairs are provided for any guests that need them. • The handicapped accessible restrooms are located inside the Begley Building, behind section A under the ramp from the student entrance. • Handicapped parking is available in the Moberly Lot past the Stadium off Roy and Sue Kidd Way on the right from the Bypass.